A teenage female driver escape serious injury when her van rolled onto its side on Dorothy Street in Saugus Friday morning. | Photo: Ryan Gilley/Two8Nine Media. A teenage female driver escaped serious injury when her van tipped over onto its left side on Dorothy Street in Santa Clarita Friday morning, according to authorities. Santa Clarita Valley Sheriff’s Station deputies and Los Angeles County Fire Department first-responders got the call at 7:10 a.m., were dispatched at 7:22 and were on the scene in front of 20316 Dorothy Street by 7:29, said LACoFD Inspector Joey Marron. 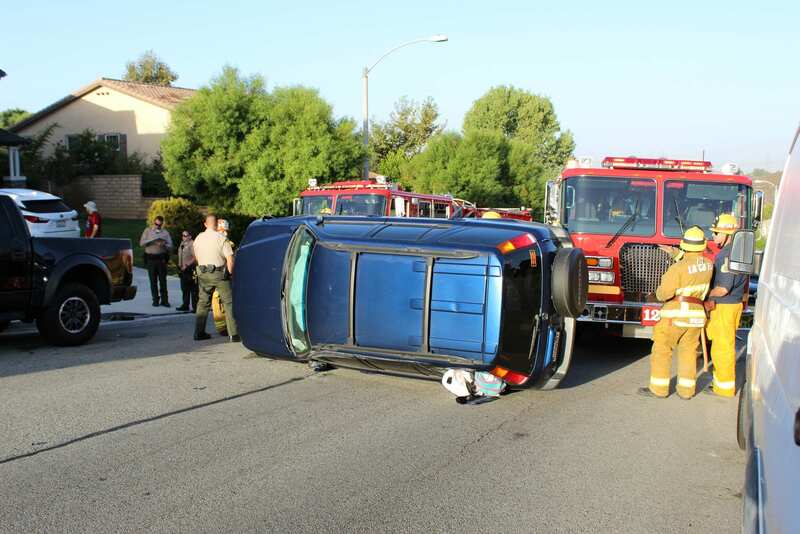 “It was a solo rollover, a vehicle on its side,” Marron said. The driver was extricated from the vehicle and taken to Henry Mayo Newhall Hospital, Marron said. He did not know the extent of the driver’s injuries. “Because it was a rollover, there was probably significant damage to the frame which prevents us from just opening a door,” Marron said. “It was a slow-tip-over, like when a semi-truck has a load shift and rolls over onto one side,” said Lt. Ignacio Somoano of the SCV Sheriff’s Station. Jason Eminian it didn’t roll over. It tipped on its side. So yes it was a tip over. Jason Eminian I bet you spell check your friends too. Brian S Engel Cheryl Ln off Golden Valley. Aren’t there speed bumps on Dorothy? It was on the new stretch down the hill. Curt came upon it this morning on his way to work. Joe Peach this is what I saw this morning. I am really curious how someone can manage to overturn a vehicle on a street with a 25 MPH speed limit……. ?